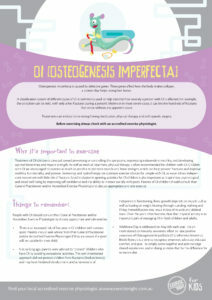 Osteogenesis imperfecta is caused by defective genes. These genes affect how the body makes collagen, a protein that helps strengthen bones. A classification system of different types of OI is commonly used to help describe how severely a person with OI is affected. For example, the condition can be mild, with only a few fractures during a person’s lifetime or in more severe cases, it can involve hundreds of fractures that occur without any apparent cause. Treatments can include bone-strengthening medication, physical therapy, and orthopaedic surgery. Treatment of OI children is directed toward preventing or controlling the symptoms, maximizing independent mobility, and developing optimal bone mass and muscle strength. 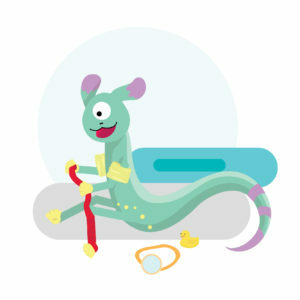 As well as medical treatment, physical therapy is often recommended for children with OI. Children with OI are encouraged to exercise as much as possible to promote muscle and bone strength, which can help prevent fractures and improve mobility, functionality, and posture. Swimming and hydrotherapy are common exercise choices for people with OI, as water allows independent movement with little risk of fracture. Social inclusion in sporting activities for OI children is also important as it optimises psychological and social well-being by improving self confidence and the ability to interact socially with peers. Parents of OI children should consult their General Practitioner and/or Accredited Exercise Physiologist to discuss appropriate and safe exercise. People with OI should consult their General Practitioner and/or Accredited Exercise Physiologist to discuss appropriate and safe exercise. There is an increased risk of fractures in OI children with contact sport. Parents should seek advice from their General Practitioner and/or Accredited Exercise Physiologist if they are unsure if a sport will be suitable for their child. Not so long ago, parents were advised to “protect” children who have OI by avoiding recreational activities. This well-intentioned approach did not protect children from fractures (broken bones), and may have hindered development and achievement of independent functioning. Bone growth depends on muscle pull as well as loading or weight bearing through standing, walking and lifting. Immobilization may result in loss of muscle and skeletal mass. Over the years it has become clear that physical activity is an important part of managing OI in both children and adults. Wishbone Day is celebrated on May 6th each year. It is an international community awareness effort to raise positive awareness of Osteogenesis Imperfecta (OI), otherwise known as Brittle Bones.It is a time to recognise, empower, advocate, educate, comfort, and give. To simply come together and acknowledge shared experiences, and in doing so make that be the difference for someone else. Swimming and hydrotherapy are common exercise choices for children with OI, as water allows independent movement with little risk of fracture. For those children with OI who are able, walking (with or without mobility aids) is excellent exercise. Having fun and gaining a sense of accomplishment are legitimate goals for an exercise program. The optimal long-term goal for children with OI is good health and independence in all areas of function (social, educational, self-care, locomotion, and recreation) using adaptive devices as needed.